It can only take one particular transistor to fail to break a whole CPU. If it happens in a core as part of the logic or caches, that core can be fused off and the die can sold as a lower core part. This is how yields are improved, by reusing the dies that have errors in removable sections. Ultimately this reduces the maximum amount of profit on offer, but it enables CPU manufacturers like Intel and AMD to sell a range of products, rather than just one from a single design. 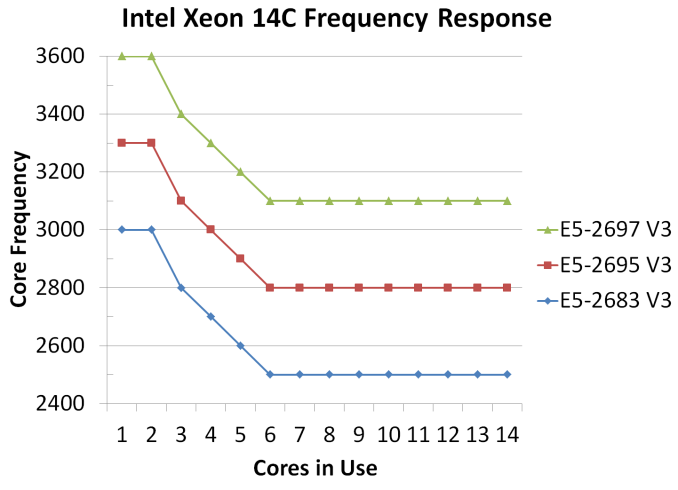 The way Intel designs its high end E5 V3 Xeons, from an 18-core die, means that its 14 core components either have at least two defects, or are perfectly fine 18 core models but need to fill up demand. I mentioned in the 12 core review that Intel can play fast and loose with their binning process, giving customers almost what they desire in terms of performance and power, as long as they are willing to pay that price. The same could be said for the 14-18 core market, but rather than offer a swathe of units, Intel offers around half a dozen ranging from a 2.0 GHz 14-core to the E5-2699 V3 2.3 GHz 18-core. Intel could release a 65W, 18 core monster, and even though it might come through at 1.2 GHz, this type of SKU is not on the roadmap (unless, perhaps, you meet the high minimum order quantity). If given the opportunity, I would like to see the process by which Intel decides to select which SKUs to bin for retail vs. OEM and custom parts. I suspect it is a combination of part market demand, part yield, part wishful thinking, but I would hope it is at least systematic. Based on the core orientation image below, there might be complications dealing with that final column of six cores, against the other columns of four, either in voltage response characteristics or discrete production errors which might also have another effect. Our samples in today come in with the E5-2695 V3 at 2.3 GHz base frequency (3.3 GHz turbo) and the E5-2697 V3 at 2.6 GHz (3.6 GHz turbo). When considering the Xeon naming stack, each number from 2695 to 2699 is taken except from 2696, and as such one might humorously postulate that Intel is merely running out of SKU names. Though an added L or W might find its way in if more models joined the list. In our last test, as well as previous reviews, the results showed that a 2P system, such as the dual E5-2650L V3s, performed poorly in most of our testing software compared to having one big single CPU in a 1P socket in most circumstances. The 1P arrangement tends to outperform a 2P system when the software is not built to take advantage of the NUMA arrangement. Intel does sell CPUs like the E5-1691 V3, a 14 core chip for 1P systems, or we can go straight into the E5-2699 V3 for 18 cores, but there will always be a market for 2P players who need the large memory capacity or who use software similar to Cinema 4D that is NUMA aware. 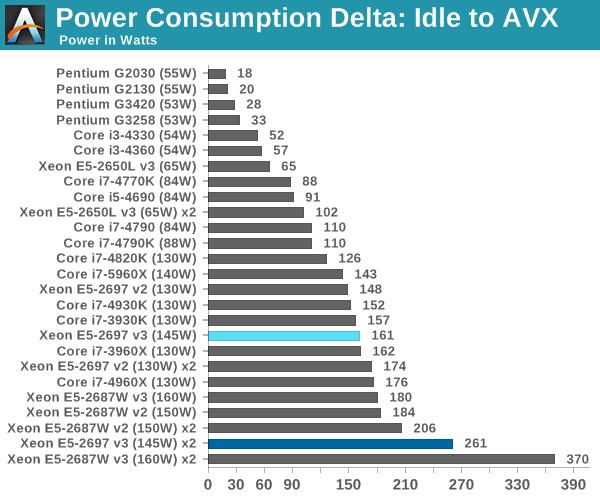 The big cores get a big power budget and a big price to match. The movement from the 2695 to the 2697 is only a few hundred MHz, but Intel charges and additional $278 for the privilege with a rise in 25 TDP. In terms of frequency response both of the CPUs follow the same path, marking an extra 300 MHz for the difference in power and price. If we did some basic 24/365 100% use calculations, using the TDP and $0.10/kWh, The 2697 V3 would consume 1270 kWh and cost $127/yr compared to the 2695 V3 which would consume 1050 kWh and cost $105/yr. This is obviously not including any additional cooling needed, but the $22 difference in power per year against $278 in the CPU price difference would indicate 15 years of running to make up the difference. Clearly the cost per CPU matters more regarding how much work is going to be done per unit time. If the contract takes less time to complete, then it can sway the preference in terms of the faster CPU if the contract is CPU compute or response bound. 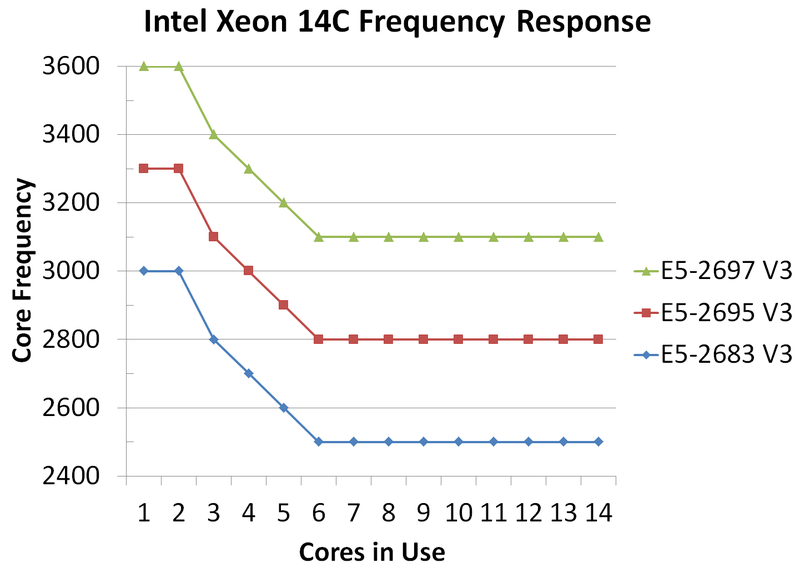 As this the third in our recent series of Xeon E5-2600 v3 performance coverage, we have covered most of the technical data in our previous two installments regarding 10 core and 12 core performance. 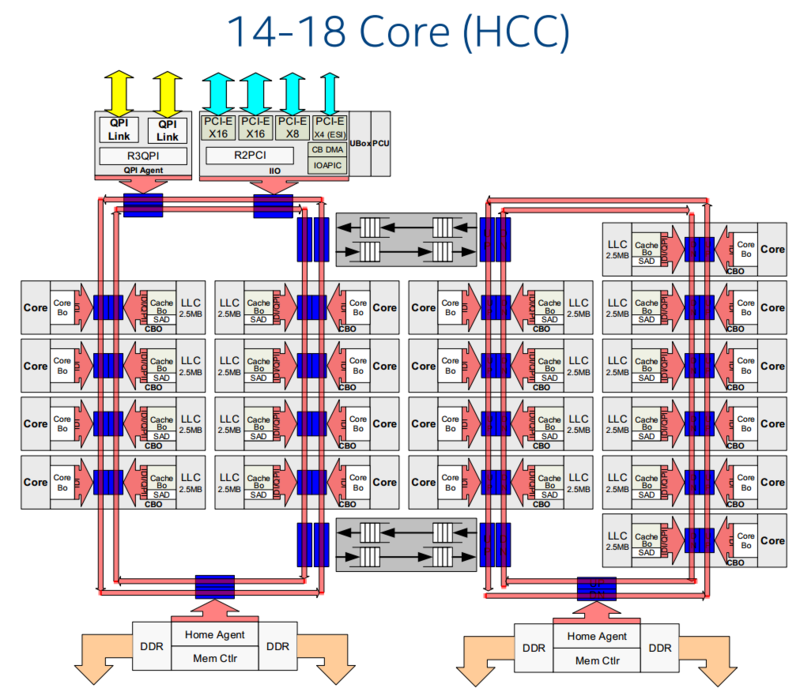 We carry over the data from those tests, but refer back for details regarding chipset and DRAM information, as well as Johan’s extensive review covering in depth more of the server-focused aspects of the Xeon E5 v3 design. As with the previous reviews, due to the timing available to test each of our CPU samples we were only able to get a limited range of E5-2695 V3 benchmark results. However, we were able to source two E5-2697 V3 CPUs for dual 14-core analysis leading to a 56-thread behemoth. Thank you to GIGABYTE Server for loaning us some CPUs and Dynatron CPU coolers.